Nothing was connected on it when powered on, and only "strange" thing was two short AC mains blackout this morning. I presume that I have to contact Rigol service. I forgot to mention that few days ago on power up it simply change everything to default and set Chinese as user language. Don't know if that two incidents are related or not. Is it possible that flash is "flashed" and that some firmware part just gone? Anyone know of possible cure or "magic" selection of buttons during or after power up that could change current state? Have you tried the 5th button reset? If this works it will also reset language to Chinese but should restore functioning... maybe. Doesn't work, but I can hear beep-beep-beep tone that gone when display color is changed to red. It seems that some "intelligence" is still there, maybe some of power signals is missing (i.e. something is happened with power supply stage). Had a quick look around Google and I can't find any other references to this problem. Power supply voltages should be easy to check but beyond that, I have no idea what to suggest, other than contacting Rigol for service. I got an offer for Rigol service that is almost the cost of the new (less capable) scope (a little more then 500 € with shipping back and forth). I was thinking before buying a new one or eventually send this one to the service, to try to open it and somehow check if only firmware is damaged. 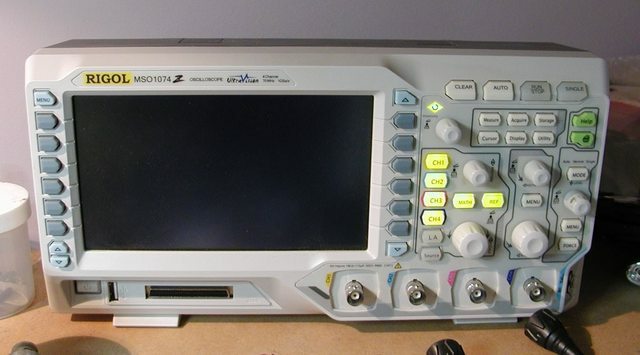 I know there is a few threads about hacking various Rigol scopes with hundreds of posts. I have a trouble to find out where to make connection (i.e. to I2C bus) and does such hacks affect only a part of firmware or simply overwrite a whole firmware. If the later is the case, maybe that could be a cure for my scope. It's possible you could have a failure of the internal Switching PSU module such that one of the voltage rails has failed. The first check should be to check that the various voltage rails are within spec. If they are not OK the problem moves on to substitution or repair of the supply. Alternatively if you have an external PSU, that can supply the same set of voltage rails, you could try powering the scope from it. Another temporary solution could be if you know of another DS1000Z a PSU swap might be a possibility. However be aware the latter solution might damage the swapped PSU. Best of luck. I've already tested PSU, and can say that all voltages are in line with what is written down on the PCB. If it's under two years old and you bought it from an EU seller, then I'd push for a warranty repair. It is clearly not fit for purpose. No, it is not. I bought it in second half of 2014. I'd probably buy a new one then. The lifespan of these looking at the engineering is a couple of years at most. I actually just shifted mine and am using an old Tek because I can actually repair that if it goes bang. Does the board have a backup battery? I think the 2000z series does have a 3V lithium coin cell. Might possibly be a dead battery issue. The coin cell battery in the DS/MSO 2000 series keeps the internal RTC going. AFAIK, the 1000z series do not have a builtin RTC and they don't need a backup battery inside. There was no RTC in mine. You could try following what happened in this thread. You might want to reseat the cables and test voltages at the power cable. The caps in the supply are cheap and high hours on the supply may be a contributing factor. So first rule out the easy stuff. I think the back of the main PCB has voltages/labels in english. I'd try to download FW update into a flash drive and see what happens. Other than this, return may be the only option. I have just tried that. Put the firmware file on a USB-stick. Insert the stick in the front of the scope and turn it on. When I turn on the scope, it gives a beep, but thats all. Ok, its fixed now. I inserted the USB-stick, and during power-on I repeatedly pressed the "Help" button on the scope. The scope booted and asked if I wanted to update the firmware. I pressed "Cancel" and the scope is now working again. Wow, firmware upload/boot from USB is mentioned in the thread. Where to obtain firmware for my scope? Other things to try is stuck buttons which may require removing the rubber button pad. You could compare your scopes power cycle to one on youtube etc to see exactly how far it's getting. See if the scope can be interfaced over network or USB, which means the software is partially running. When you do "flash erase" procedure the software reverts to Chinese, so if you can somehow try another "flash erase" or setting the "power set" condition to "default" instead of "last". After a power cycle it will wipe the configuration instead of trying to revert (possibly corrupt settings). Keep in mind actually re-flashing is not always the answer, you want to get a general idea of signs of life. Flashing a partly inoperable piece of equipment can cause it to die during the flashing process. So I'd just be interested to see if the other tests I mentioned make a difference or you get a response on screen from initiating a flash update. Which indicates it's more alive than you think. I have a DS1102E which I've never opened. However, I have been inside my Insteks to look around. Having repaired a Tek 465 and a Dumont 1060 the thing that struck me was how easy it was to sort out the circuitry when it's all on a single board. It's much harder with multiple boards stacked on top of each other. In fact, it seems to me that you could probably extract a schematic using photographs and a bit of AI. 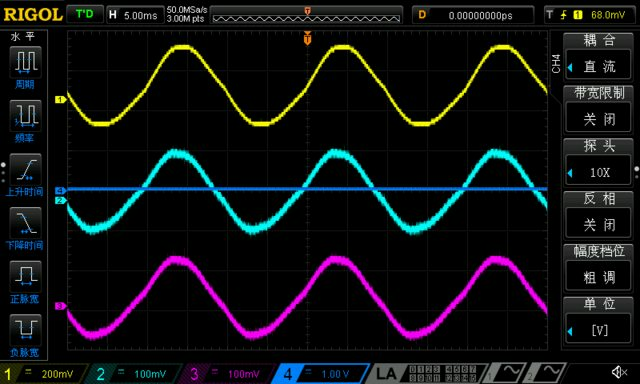 An emitter follower shouldn't be that hard to recognize. It may not be repairable economically, but there is certainly nothing to be lost if you are cautious. Of course, you *will* need another scope if it's anything more difficult than the PSU. I'd buy a new scope and treat this one as a repair project when I felt like messing with it. Or sell it to DC1MC who is looking for a dead unit for parts. This was a brand new (a couple weeks old) DS1054Z that would randomly crash like this. Sometimes the screen was dark. Sometimes the screen was still being updated. But in all cases the controls became unresponsive. Typically, before this, the hardware frequency counter would stop updating; the last read value would remain latched. 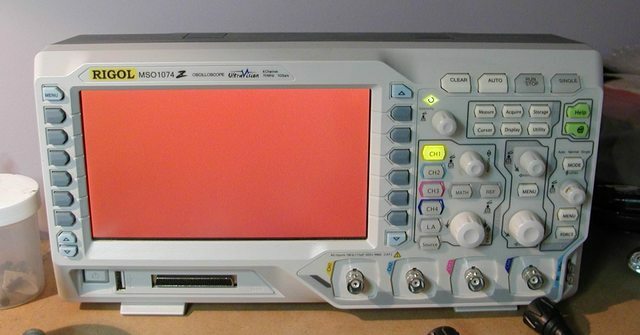 Then it was just a question of time before the oscilloscope became unusable. This particular unit was replace under warranty. I'm afraid that my unit is ready for scrapyard or for DC1MC (that is forum member or what?). I tried with firmware update, but it doesn't work, or I don't understand procedure that is rather simple: copy firmware on the USB stick formatted as FAT32 and reboot the unit. Nothing happened. Great, so over time we can expect a full rainbow . The lifespan of these looking at the engineering is a couple of years at most. What aspects of the engineering are you „looking at“ to reach that conclusion?